Jennie Chatwin Jones Merkley died peacefully at the University of Utah Hospital on October 14, 2018, in Salt Lake City, Utah, at the age of 101. 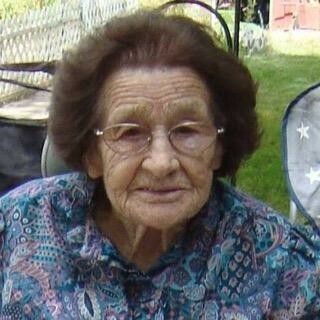 She was born on September 23, 1917, in Tabiona, Utah, to Nephi and Sarah Chatwin. She had 12 brothers and sisters. She rode her horse, Old Pint, to school where they met in a one-room log cabin in Tabiona. They worked hard and played hard, and she especially loved being outside helping her dad. She married Curtis H. Jones on May 15, 1935, and they were later sealed in the Salt Lake Temple on October 14, 1949. They worked side by side for years logging timber off Wolf Creek while raising kids. Curtis died in 1970, after which she worked at local cafes cooking and making people smile. She spent most of her life in Tabiona until moving to Duchesne where she married Jerry Merkley on January 27, 1983. There she loved growing a beautiful garden each year and loved giving all the veggies away even more. Jennie will be remembered as a generous, witty, and hard-working person who loved helping others and was a true example of charity and service. She had a unique vocabulary that kept everyone around her laughing. She was famous for her homemade noodles, monkey bread, and pizzelles. She loved decorating her home for holidays and made sure everyone had a Christmas present. She is a member of the LDS church and had several callings, a member of the DUP for over 75 years, and the Century Club of Utah. When asked her secret to a long life, she said to work hard and be nice to everyone. Jennie was a mother to 11 children. She is survived by her children, Cleo (Lewis) Hackford of Tabiona, Linda (Byron) Stone of West Valley, Faye (Ralph) Woolsey of Magna, Butch (Brenda) Jones of Las Vegas, Jana (Brent) Sweat of Fruitland, and Marvin Jones of Duchesne. She is preceded in death by her husband and children; DeEtta Casper, Loretta Casper, Leon Jones, and two baby boys. Jennie leaves a legacy of over 230 grandchildren, all of which she made feel special. Our gratitude goes out to the wonderful people at The Villa in Roosevelt for all their love and kindness. Funeral services will be held on Saturday, October 20, 2018, at noon, at the Tabiona Chapel of the Church of Jesus Christ of Latter-day Saints, a view will be held prior from 10-11:45 a.m.
Burial will be in the Tabiona Cemetery.